SunTimes shows times of sunrise, sunset, as well as morning and evening civil, nautical and astronomical twilights. It displays also the length of day, between sunrise and sunset, and also between the various morning and evening twilights. It also indicates the maximum sun altitude for the day of interest, and the minimum sun altitudes for the previous and next days. column 2 is the morning astronomical twilight time. column 3 is the morning nautical twilight time. column 4 is the morning civil twilight time. column 5 is the sunrise time. column 6 is the noon time. column 7 is the sunset time. column 8 is the evening civil twilight time. column 9 is the evening nautical twilight time. column 10 is the evening astronomical twilight time. column 11 is the day length between sunrise and sunset. column 12 is the day length between civil twilights. column 13 is the day length between nautical twilights. column 14 is the day length between astronomical twilights. column 15 is the previous minimum sun altitude, in degrees. column 16 is the maximum sun altitude, in degrees. column 17 is the next minimum sun altitude, in degrees. 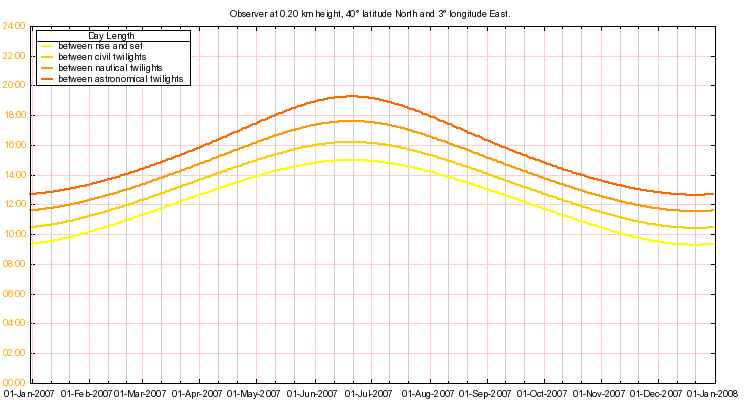 Values between 01/08/2007 and 10/08/2007 at 0.20 km height, 40° latitude and 3° longitude. Column 2  is the morning astronomical twilight time. Column 3  is the morning nautical twilight time. Column 4  is the morning civil twilight time. Column 5  is the sunrise time. Column 6  is the noon time. Column 7  is the sunset time. Column 8  is the evening civil twilight time. Column 9  is the evening nautical twilight time. SunTimes can generate a single image file with three different plots. The x-axis corresponds to the days. The upper plot contains the transit, sunrise, sunset and twilights times. The middle plot contains the lengths of days, from sunrise to sunset and between the different morning and evening twilights. 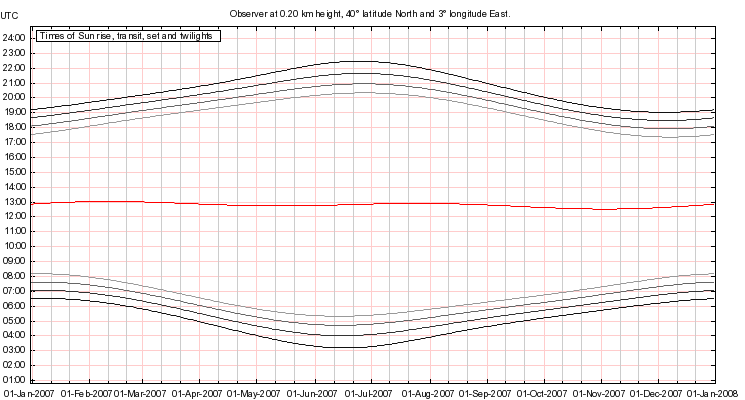 The lower plot contains the minimum and maximum sun elevations. 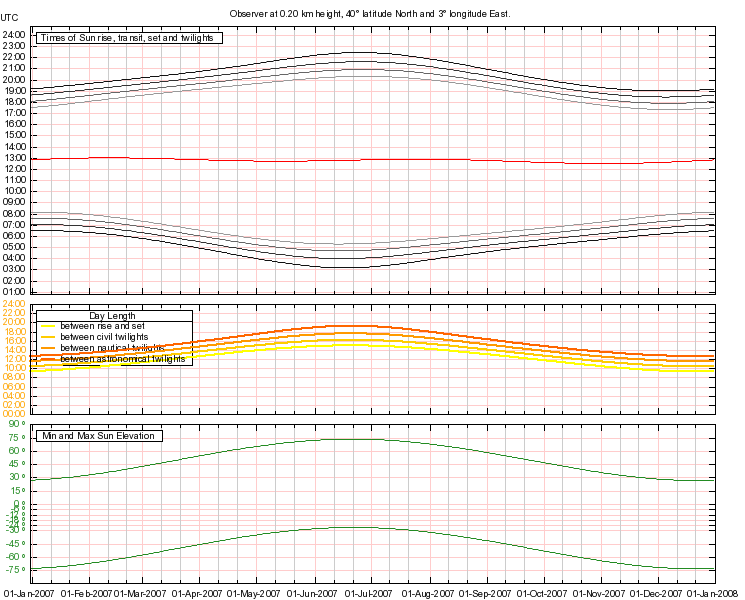 The red line is the UTC sun transit time. The gray lines is the UTC sunrise/sunset and civil, nautical and astronomical morning and evening times. The orange lines correspondent to day length from civil, nautical and astronomical twilights. 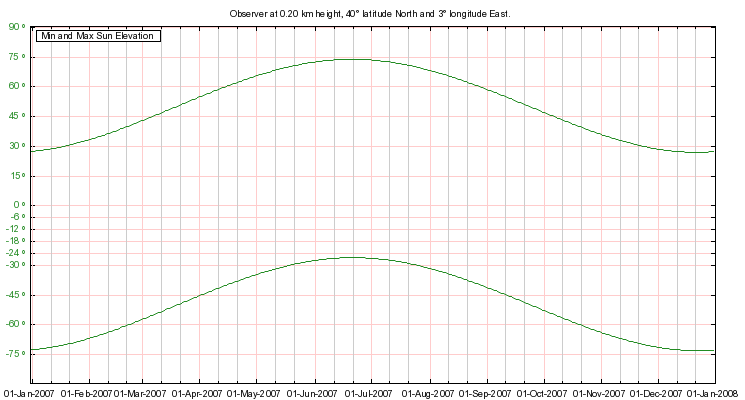 The green lines correspond to minimum and maximum sun elevations. SunTimes has been developped in C# under MonoDevelop 2.0. It can also be compiled under Visual Studio Express 2010.
refract     Indicates if the atmospheric refraction is accounted for. graphalt    Path to the Altitudes png file that will be created. heightalt   height of the Altitudes png image, in pixels. Default is 400.
widthalt    width of the Altitudes png image, in pixels. Default is 745.